Other English names: Scarlet Clover, Italian Clover, German Clover. Crimson Clover is an annual plant with a strong taproot provided with the nodules characteristic of all leguminous plants. From the crown of the root numerous upright stems develop which reach an average height of one or two feet. They are soft in texture and covered with soft hairs. The leaflets are somewhat similar in shape to those of common Red Clover, but are shorter, broader, covered with short hairs and toothed in their upper parts. The flowers are in a prolonged, spikelike head which has a peculiar bluish green tint before flowering. The head, which is from one to two inches long when fully developed, contains a great number of flowers, the development of which gradually proceeds from the base to the top. The flowers are rich scarlet or crimson and somewhat longer than those of the common Red Clover. Crimson Clover is indigenous to Europe where it occurs in France, Italy, Spain and in the valley - of the Danube. In many cases, however, it is doubtful whether the plant is really wild or has only escaped from cultivation. Its cultivation, which for a long time was confined to northern Italy, southern France and the country around the Pyrenees, is now rapidly spreading. The northern limit of the plant, which was approximately northern Italy before its cultivation began, is now extended to southern Sweden. In America it is grown in practically all the eastern states of the Union, especially southward. In Canada it is only grown to a limited extent and is scarcely found except in southern Ontario and British Columbia, except as a cover crop in orchards. Crimson Clover is well adapted to poor soils. This may be partly due to its strong root system, which enables the plants to gather nourishment from a large area. On light, sandy soils, where Red Clover would not thrive, Crimson Clover may yield large crops. This is especially true if the plants are given sufficient lime and water. It thrives best on sandy loams which contain a rich supply of plant food, and on such soils, if the climate is favourable, it will produce a luxuriant growth. On heavy or moist cold clay the return is scanty. 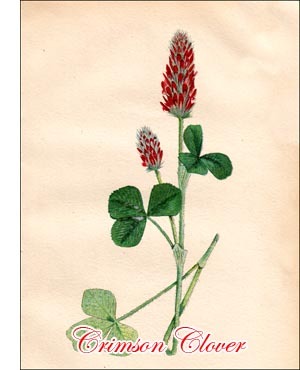 Being a resident of southern Europe, it is evident that Crimson Clover likes a warm climate. When found wild, it is a so-called winter annual; that is, the seeds germinate in the fall or during the summer and the young plants reach full development relatively early the following season. In Canada only the southern parts of British Columbia are mild enough to insure the plants living through the winter. Even in southwestern Ontario the returns from late-sown seed are uncertain. It is therefore the general practice to sow Crimson Clover early in spring and harvest the crop the same season. Although it requires a warm climate and is able to make a surprisingly good growth in sandy soil, Crimson Clover cannot endure severe drought. It does well in light soil that can be irrigated during the growing season. Crimson Clover has a high nutritive value and can be used for either hay or pasture. It is valuable for soiling purposes in short rotations and in orchards, as the green matter produced is heavy and the roots penetrate deep into the ground. Crimson Clover hay is readily eaten by all kinds of farm animals and is claimed to be especially suitable for those doing heavy work. Like other clovers, it has its highest nutritive value when in flower and should not be cut for hay later than in full bloom. The blossoms are provided with a great number of rather long hairs, soft and harmless before the plant has reached the flowering stage. When it blossoms these hairs become stiff and may cause serious indigestion. Experience has therefore shown that it is advisable to, cut Crimson Clover a little earlier than in full bloom. Harvesting may be done in the same way as for Red Clover. Where the winters are mild enough to allow Crimson Clover to be sown late in the summer, it can be pastured the same fall and then early next spring. Where the climate, as in Southwestern Ontario, makes spring sowing necessary, pasturing must be limited to one season. In those sections of Ontario where Crimson Clover is grown, it is commonly used as pasture for hogs. Fifteen to twenty pounds of seed should be used to the acre.